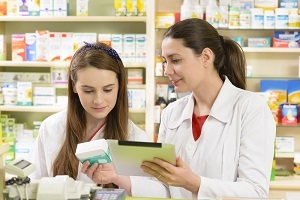 Drug Pairing Dangers and Pharmacy Dispensing Negligence | Kennedy Hodges L.L.P. When you go to the doctor for anything other than a routine exam, the likelihood of your leaving with a prescription is pretty high. In fact, the Food and Drug Administration (FDA) estimates that two out of every three doctor’s visits result in the prescription of at least one new medication. As a result, nearly three billion prescriptions—roughly ten times the number of people in the population—are filled each year in the United States. This means that everyone in the U.S. could potentially be taking ten different medications at one time. Although these prescriptions may be medically necessary when taken individually, a problem arises when your doctor prescribes multiple medications without considering how the drugs may interact with one another. Unfortunately, with the number of drugs on the market and the average number of prescriptions filled, the risk for adverse drug effects are a major public health problem. Drug interactions, in which one drug negates, alters, or amplifies the effects of another, place thousands of trusting patients at risk every year. Though you may not hear about them in mainstream media, the following drug pairing statistics are newsworthy for those who are prescribed more than one medication at a time. Annual drug interactions from the combination of two or more medications: two million incidents. Annual deaths caused by the effects of drug interactions: 100,000. Annual U.S. drug interaction fatality rating: ranked as the fourth highest cause of death, higher than car accidents, diabetes, and AIDS. Despite the obvious risks, little progress has been made to identify, let alone solve, the underlying problems associated with taking multiple drugs. The common yet dangerous belief among doctors and drug manufacturers is that prescriptions have several lines of defense to prevent pairing reactions. Unfortunately, these defensive lines aren’t always strong enough to catch the problem. First line of defense: you, the patient. When discussing potential prescription options with your doctor, you must verify the medications you are currently taking. Although he should have an accurate list in your medical record, it’s up to you to make sure his list is up-to-date. If he overlooks or fails to clarify information, he may accidentally prescribe a drug that is known to react badly with one of your medications. Second line of defense: the prescribing physician. As the prescribing physician, your doctor has a responsibility to protect you from dangerous drug interactions. Unfortunately, he may not have your medical record or the numerous adverse drug combinations memorized. Furthermore, doctors often know less about a drug’s combination effects than they do about the purpose of the drug itself. Third line of defense: you, again. If your doctor prescribes a new drug, take the initiative to bring up potential drug interactions. Ask him if the new drug has had any combination effects with other drugs—specifically, the medications you already take. Fourth (and last) line of defense: the pharmacy. The pharmacy that fills your prescription is the last professional defense there is to prevent a drug interaction. Once you take your prescription home, there’s no one left to warn you or keep you from mixing your medications. Pharmacists have (or should have) unique skills and resources to identify potential drug reactions before they even fill the prescription. Unfortunately, a recent study conducted by the Chicago Tribune shows that many pharmacies fail their customers by overlooking warnings or disregarding these potential threats altogether. How often would a pharmacy fulfill the order? How often would the pharmacist warn the patient of the potential combination effects? How often would the pharmacist or technician question the pairing? How often would a technician discuss the combination with the pharmacist, or how often would the pharmacist discuss the pairing with the prescribing physician? Independent pharmacies had an average failure rate of 72%. Dispensing safety protocols are ignored for the sake of “efficiency.” No one wants to wait around while the pharmacist tries to contact your physician or question the prescription. Safety precautions are disregarded. Computer alerts that flag dangerous drug combinations are overlooked and purposefully overridden. When these alerts pop-up over and over again, pharmacists develop “warning-fatigue” and bypass them without even looking at the alert. Training focuses more on speed than safety. The pressure to earn high performance metrics is valued above safety laws, common sense, and customer safety. What’s even more amazing is that the uncovered flaws were not confined to one pharmacy or one pharmacist; they weren’t even limited to one pharmacy chain. The uncovered flaws are truly black marks on the industry as a whole. Therefore, since the problems are all-inclusive, they require a comprehensive solution. The Tribune followed its report with a statement that said: “In response to the study’s findings, CVS, Walgreens, and Walmart each vowed to take significant steps to improve patient safety in their stores nationwide.” Unfortunately, these “significant steps” come far too late for some, and are little comfort to others. If you or a loved one suffered severe drug interaction effects as a result of pharmacy negligence, you’re entitled to file a personal injury claim. It is important, however, to act quickly as strict time limitations may apply. Contact our office today at 888-526-7616 or visit our Houston office to learn more about your legal rights and how to pursue a strong pharmacy error claim.